(L-R) CAASTRO team members Associate Professor Scott Croom, Professor Elaine Sadler, Professor Bryan Gaensler and PhD student Kitty Lo. The sky is no longer the limit, with CAASTRO - the new ARC Centre of Excellence for All-sky Astrophysics - launching on 12 September 2011. CAASTRO is taking a revolutionary new approach to astronomy by using an all-sky perspective to answer the big questions about our universe. CAASTRO brings together unique Australian expertise across six Australian universities, along with local and international partners. The new centre is led by the University of Sydney, in collaboration with the Australian National University, the University of Melbourne, the University of Western Australia, Curtin University and Swinburne University of Technology. 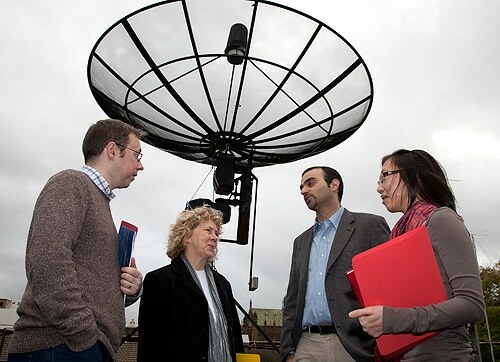 CAASTRO brings together expertise in radio astronomy, optical astronomy, theoretical astrophysics and computation to investigate three interlinked themes: the evolving universe, the dynamic universe, and the dark universe. "CAASTRO is a major new initiative that is revolutionising the way we see the universe," says Professor Bryan Gaensler, director of CAASTRO and based in the School of Physics at the University of Sydney. "The traditional approach to astronomy has had a lot of success, but we're now running up against a whole range of questions these old approaches can't answer. "The big unsolved questions in astronomy demand entirely new approaches, requiring us to look at the whole sky at once, rather than studying single objects in the sky in isolation. "You really need to look at how everything works together to truly understand what is going on out there and that's what CAASTRO will do with our all-sky approach to astronomy. "CAASTRO research will use wider fields of view, with bigger data sets, processed more deeply and more subtly, than anyone has attempted before. "In the last few years, Australia has invested more than $400 million in new wide-field telescopes and the high-performance computers needed to process the resulting torrents of data. Using these new tools, Australia now has the chance to be at the vanguard of the upcoming information revolution in all-sky astronomy." The evolving universe: when did the first galaxies form, and how have they evolved? The dynamic universe: what is the high-energy physics that drives rapid change in the universe? The dark universe: what are the dark energy and dark matter that dominate the cosmos? Professor Gaensler says CAASTRO's strength is that it will be a collaborative structure that for the first time combines the relevant expertise and resources into a single coherent unit. "In addition to our revolutionary science, we've decided right from the outset that CAASTRO should also put a high priority on training the next generation of scientists, on providing a family friendly environment for all our staff, and engaging with schools and the public with outreach activities," he adds.